Kenya’s top female rap star Stella Mwangi has been winning, that much we know. Based all the way in Norway, STL has been repping the 254 to the fullest with her undeniable rap talent, and she has done it again. 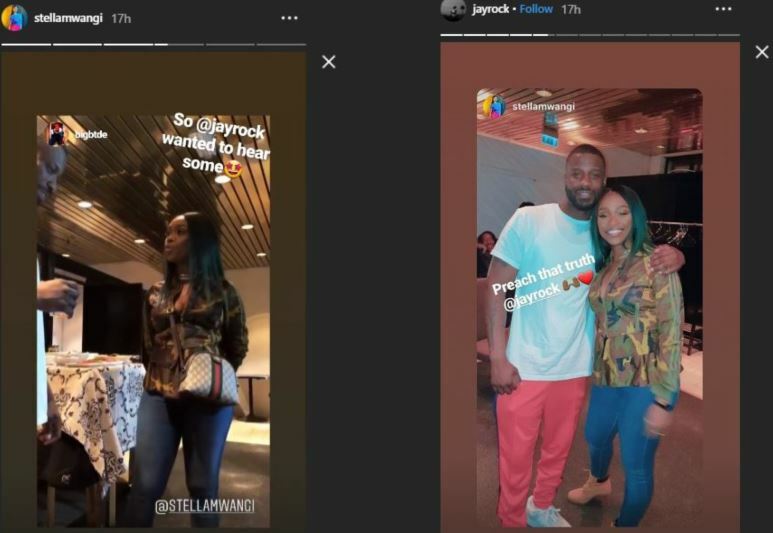 Just months after she left an impression on American actor Dwayne The Rock Johnson, Stella Mwangi has now impressed US rapper Jay Rock. Jay Rock is a California based rapper signed under independent record label Top Dawg Entertainment (TDE). He is also a member of the hip hop collective Black Hippy alongside fellow West Coast rappers and TDE label-mates Kendrick Lamar, Schoolboy Q and Ab-Soul. The ‘WIN‘ rapper and Kenya’s very own Stella Mwangi met on Monday night in Norway where Jay Rock was performing for his Big Redemption Europen Tour. Stella Mwangi, being a fan of Jay Rock, was at the concert, and as resourceful as we have always known her to be, she was able to get a one on one moment with the rapper and show him what a girl from Maragua, Murang’a County can do. In a post on her Instagram Tuesday, Stella Mwangi shared a clip showing the moment she dropped some freestyle bars with Jay Rock keenly listening. Jay Rock has since started following STL on Instagram, and we can only hope it is the beginning of a possible collaboration between the two. Perhaps even a collabo with Kendrick Lamar, who knows? Watch Stella Mwangi freestyle for Jay Rock below. Scroll through for the full footage.